Bill Dougal specializes in presenting important lessons with humor, music and graphics. Bill earned his BFA from the University of Hartford’s Hartford Art School in 1973. He earned a CT Adjunct Arts Instructor Permit, and CT State Teachers Certification. He has taught all types of art to all age groups. Eastconn’s Arts Magnet High School (ACT) had Bill teaching art part time for 9 years. Other teaching venues have included MCTC, TLC, QVCTC, ALC, and NFA. The CT Art Teachers association and the CT Teen Librarian association have had him make presentations. As a working professional artist, Bill brings practical knowledge. As an entertainer, he brings fun to the experience. At a national caricature convention (NCN) he was voted into the top ten. The CT Art Directors Club awarded him a prize for outdoor advertising design. As a freelance illustrator, he has had work published in The Valley Book, The Hartford Courant, The CT Business Journal, and numerous advertising projects. 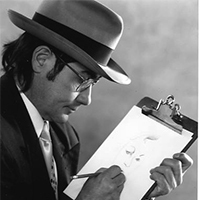 As a caricaturist, he is busy drawing for private parties, business promotions and gifts. Musical Performance acts are outlined on www.dougalmusic.net. Tenure as a caricaturist at Mystic Aquarium inspired and informed his Fish Fact CD and video. He has acted and produced video productions. His multi-disciplinary experience in the arts supplements his teaching of the visual arts. Bill believes that art is very important part of a student’s education. Facilitating skills of pre-visualization, planning, creative thinking and translating ideas to paper are his specialty. For short vdeo sample of each act see Youtube; seach for Bill Dougal > channel.